Hands up if you weren't one of the lucky kids who grew up in the presence of a kid-sized electric car, one of those pink Barbie Jeeps or sleek convertibles. If you're still bitter about not being able to squish your body into a tiny car but aren't keen on smart cars, then you're in luck my friend: the world's smallest roadworthy car might just be right up your alley. Austin Coulson had a vision. 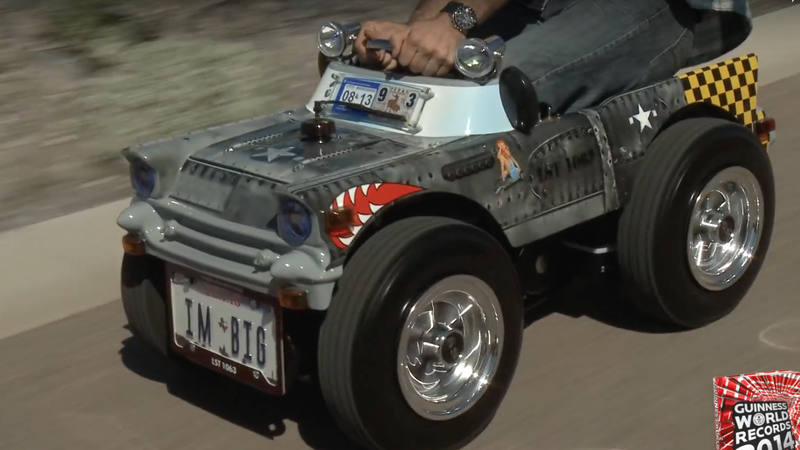 Growing up, he wasn't necessarily one of the kids who craved a tiny electric Jeep, but he was determined to end up in the Guinness Book of World Records for something automotive. Putting together the world's smallest car? That was right up his alley. According to the Guinness World Records website, the car is 63.5cm high, 65cm wide, and 1.26m long. Its size means that it can't go more than 40km/h, but as long as Coulson doesn't need to go for a cruise on the highway, he can absolutely take it on the road. In fact, you can often spot him tooling around Phoenix in it. The gas mileage on this tiny thing is incredible. Coulson can get up to 136km per 3.7L in it - but before you start wondering if you should start trying to beat his record, you need to know that the gas tank has to be small, so it can only hold a half gallon at a time. And, y'know, you also have to compromise on suspension. Hopefully you're not planning on going off-roading any time soon. Coulson's mini-car is one of those things you could either easily miss or immediately pick out of a crowd. To keep it a little more memorable, it's painted after the US P-51 Mustang military plane. And for a personal touch, the sides are inscribed with the tail numbers of a ship that Coulson's grandfather served on in WWII. You can spot it in local veterans' parades in Phoenix sporting vanity plates reading "IM BIG". Even though it's not a massively practical vehicle, Coulson is proud of it. He built it from scratch in his own garage, piecing together the body of a '57 Chevy Bel Air, adding into it the drive train, transmission, and engine from a road-legal quad. The car also contains seatbelts, headlights, tail lights, turn signals, a functional horn, rearview mirrors, and a custom 8cm by 23cm safety-glass windshield. The meticulous attention to detail means that this mini vehicle is pretty much just a scaled-down version of the cars you already know. Is it cool? Hell yeah. I wish I had Coulson's kind of determination to build a whole, tiny car from scratch. Would I drive it? Maybe not. There's something a little terrifying about imagining a jacked-up truck pulling up behind my little kiddie car. But I gotta say, it's something I'd love to see with my own two eyes one day.